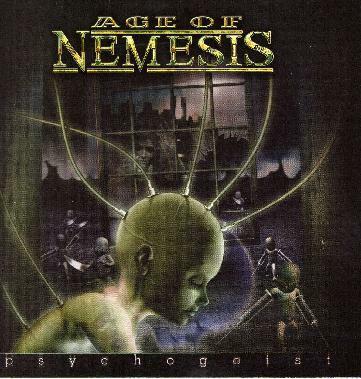 Age of Nemesis - "Psychogeist"
The Age of Nemesis is a five piece Hungarian band. This is their fifth CD (and only the second to be sung in English) but the first under the new name. They were previously known as Nemesis. The band plays a quite cool brand of progressive heavy metal. The music reminds me of Queensryche at times but is often much heavier than Queensryche. The first 6 tracks on the CD are part of a story. The opening track of the CD ("Fate's Door") is also a very cool video you can see on your computer. Some of the tracks like the title track (which has a pace like you are running), seem like a technical workout lack something besides all out great playing. "Breaking Away", the next track, is something completely different with a great piano interlude. "The Goddess Nemesis" is a great instrumental with some great band jamming. The CD closes with another instrumental, "Awaking Minds", which is a short acoustic guitar and piano piece. For the most part this CD tells a cool story (although the lyrics are not included) and contains some great heavy metal. I hope we get a chance to catch them live! For more information you can visit the Age of Nemesis web site at: http://www.ageofnemesis.com.